Do you have great ideas or resources on movement building, climate change, clean energy, environmental justice and more to share (e.g. suggested books, films, Youtube videos, speakers, events, etc.)? Please email them to outreach(at)350colorado.org to share on this developing page! Thank you! How to make a Facebook fundraiser! Trainings & Art, Graphics, etc. Looking for some extra learning? Check out this reading list! Here are a few ideas below. Please email us as you/your team develops event ideas! Check out 350.org’s amazing resources and workshops for more ideas HERE! Film screenings are a great way to educate people and start dialogue on issues that concern us. Click here for some great suggestions from leaders in our network. Workshops: We are developing “Fossil Free Your Life” workshops to share ideas for rapidly transitioning beyond fossil fuels in our own lives. We’re planning workshops on home energy efficiency and conservation, growing your own food, natural gas alternatives, transportation and more. If you have an idea for a workshop you would like to host or lead, please contact Micah@350colorado.org. Speaker series: We have contacts who can speak on many topics dealing with climate and the transition to a clean energy future. 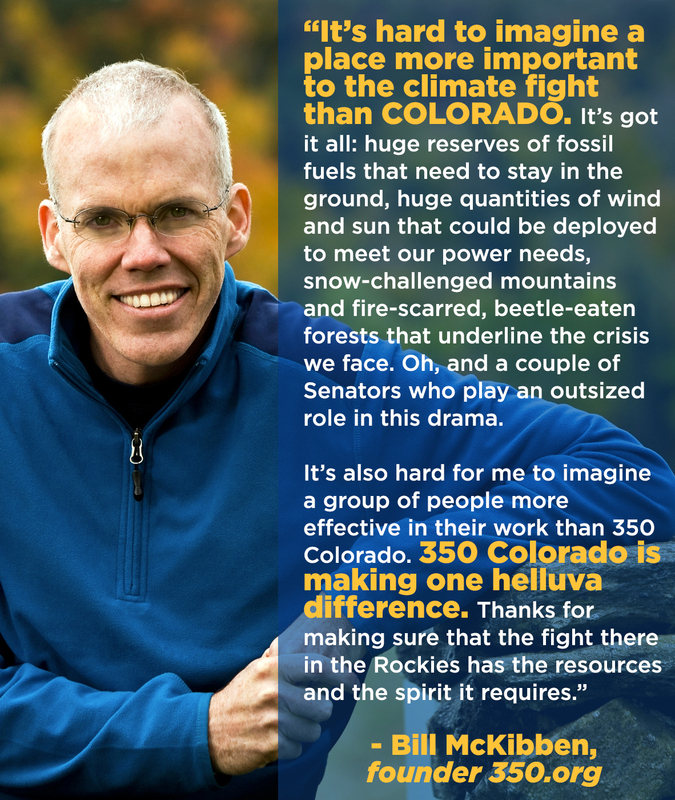 Contact Micah@350colorado.org to find out more. Contact micah@350colorado.org if you would like to schedule a specific organizing workshop for your team.